The Fritz!Fon is designed for use with the recently reviewed FRITZ!Box 7490 router/telephone system and as such if you don’t have the Fritz!Box this isn’t the phone for you, it has loads of great features but they’re only available if you have the Fritz!Box. Also worth noting that at the time of review the Fritz!Fon doesn’t come with a UK plug so be sure to add a plug adapter onto your order if you’re getting this. With those two points in mind this is a cracking little handset. 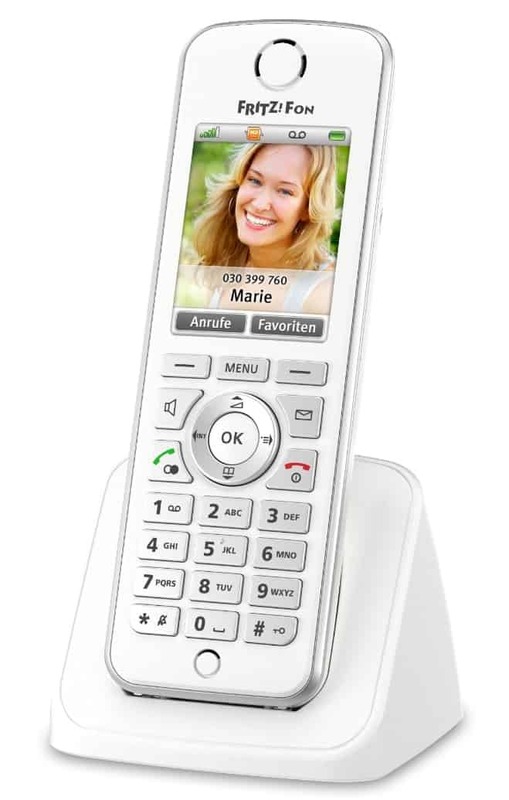 It looks really smart and the screen is a massive improvement over a set of Philips telephones also being used with the Fritz!Box. There are a load of features built into the phone, but most impressively was the basic call quality, calls sounded much better than my existing telephone and were similar to HD voice calls on EE mobiles. Being designed to work with the Fritz!Box you get access to loads of functionality. The phone accesses the global telephone book and call logs within the Fritz!Box and when connected it’s assigned an extension number, allowing you to make calls internally (see video below for an example of this in action). If you happen to have taken the time to attach pictures to contacts you’ll see those images on screen when calling, as you would on a mobile. You can even access RSS feeds, emails and media although if you’ve a smart phone you’re better off using that, these functions aren’t great or especially practical and feel like they’ve been added on just because the manufacturer can. There is a headphone socket on the side which does come in useful if you want to listen to podcasts, especially if this were sat by your bed and your mobile wasn’t up to the job at the end of the day due to a low battery. The overall design is brilliant, it sits nicely in the hand and is a good weight. The call quality is great and there are so many features on off, but keep in mind to get the most out of the Fritz!Fon C4 you’ll need a Fritz!Box.